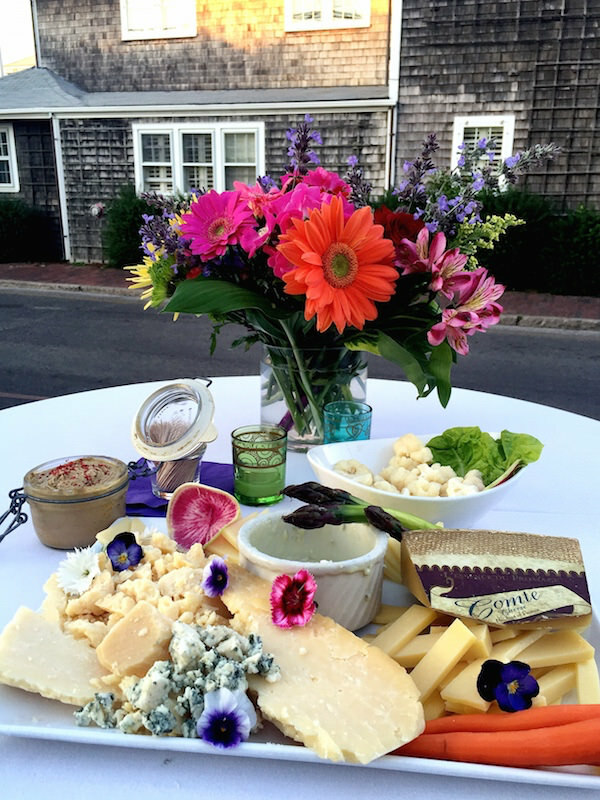 For this summer, I am initiating a fun little weekly series, Friday Five Favorite Finds, which I find on my travels out and about on Nantucket. My inaugural offering was made easy as I attended a cocktail reception Thursday evening for the five businesses housed at 2 South Beach Street. Some veteran Nantucket outposts and some new, they all deserve a visit. 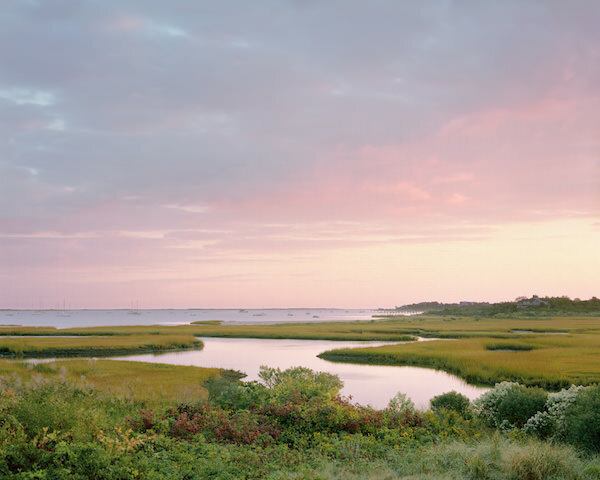 In his third summer at 2 South Beach Street, photographer Michael Gaillard is no stranger to Nantucket. Island born, now living in Brooklyn, he received his BA from Stanford, a Post-Baccalaureate Certificate from the School of the Museum of Fine Arts, Boston and an MFA from Columbia. 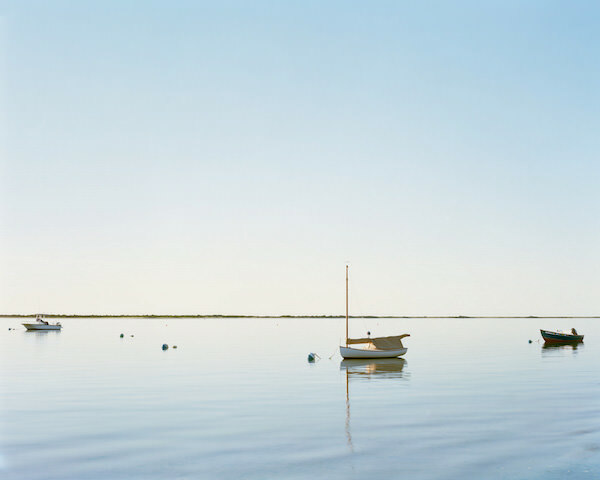 His ethereal large scale landscape photographs are exquisitely printed, adding an authentic sense of place and atmosphere to the hundreds of private collections worldwide where his work is included. Above, Shimmo Evening and below Dawn in the Creeks – both images available in Small (21×25), Medium (40×47), and Large (60×72). 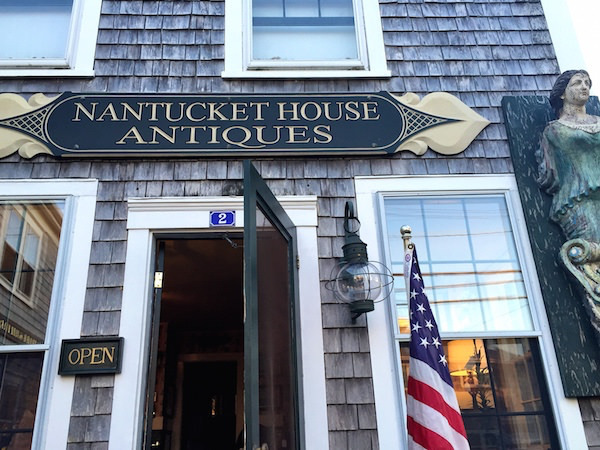 Established in 1973 by Sandi and Hudson Holland Jr., Nantucket House Antiques and Interior Design subsequently moved to 2 Beach Street in 1980. Now run by son Tucker and wife Michelle, the shop is known for its English and American country furniture. 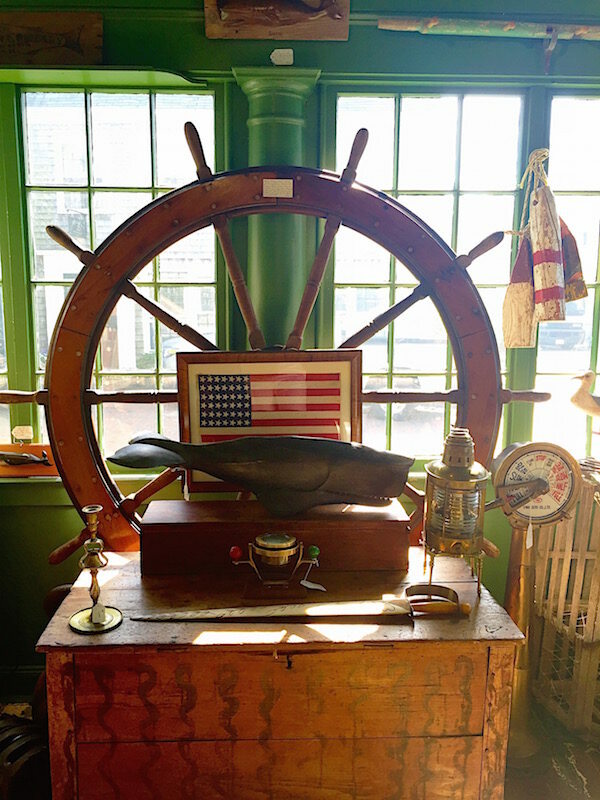 Below a vignette in the shop including an antique mahogany ship’s wheel with ten spokes and mother of pearl inlay that had been washed ashore in Sconset, a rare 1890 flag (never an official US one) with 42 stars for the annex of Washington Territory and a folk art sperm whale. A newly renovated space is being shared by two sophisticated New York and Connecticut businesses. 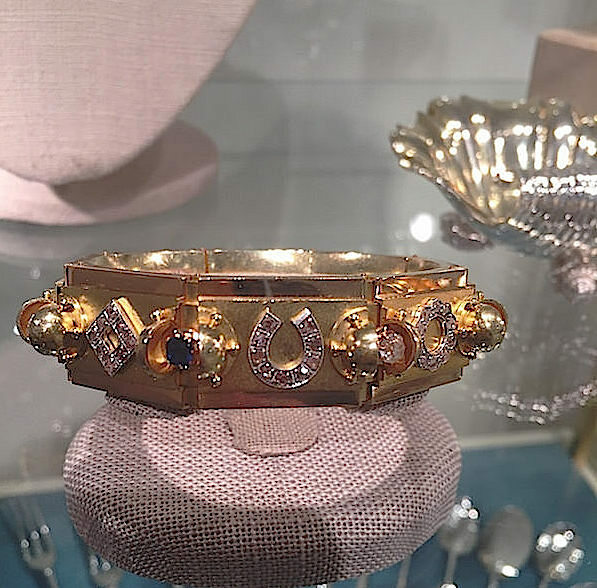 Established in 1912, James Robinson originally specialized in silver and antique Chinese porcelains, growing to include English and French porcelains and glass, a distinguished collection of antique jewelry and hand-made sterling silver, below. 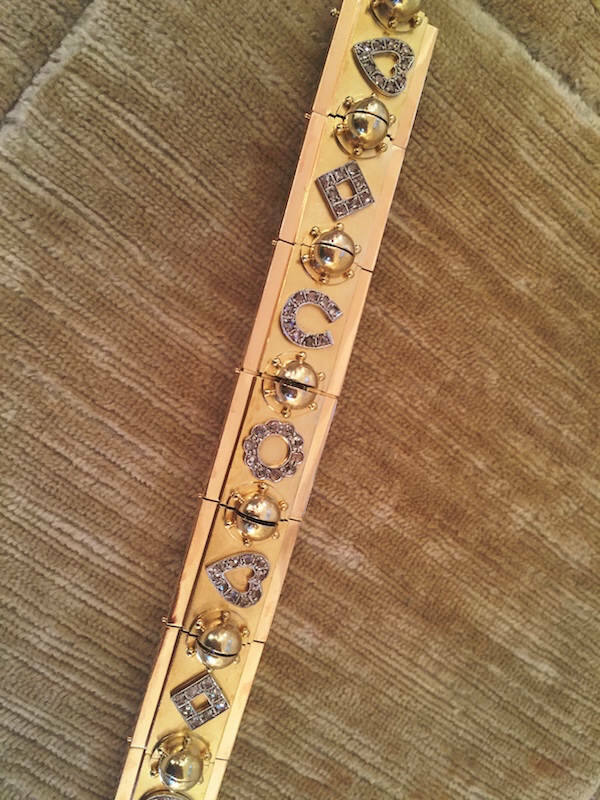 I was intrigued by the unusual gold bracelet including symbols of luck below. When closed, small spheres cover the segmented joints. And when open, the joints separate, and the balls to reveal small gemstones – an enviable surprise. 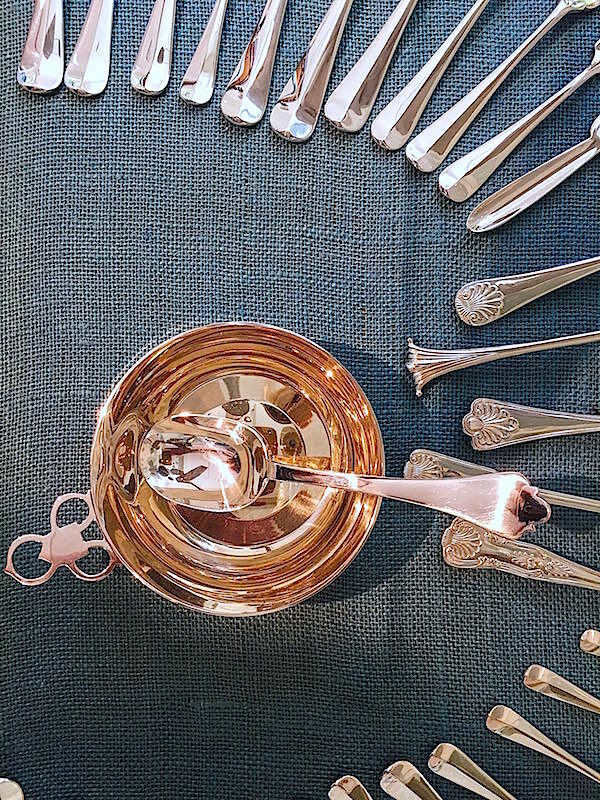 Now represented by fourth and fifth generation family members, the business has expanded their collection to include modern, handmade silver. 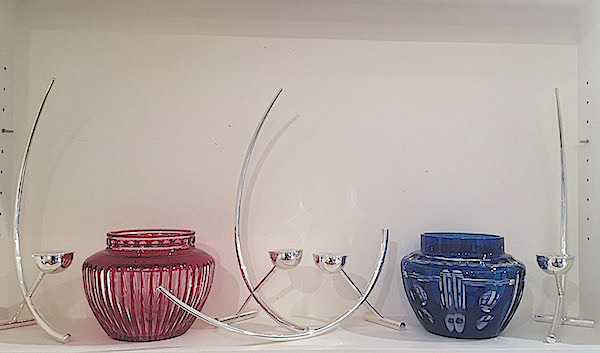 Below, early 20th century Val St. Lambert glass with contemporary handmade sterling candlesticks. R. Simantov jewelry walks the line between past and present. 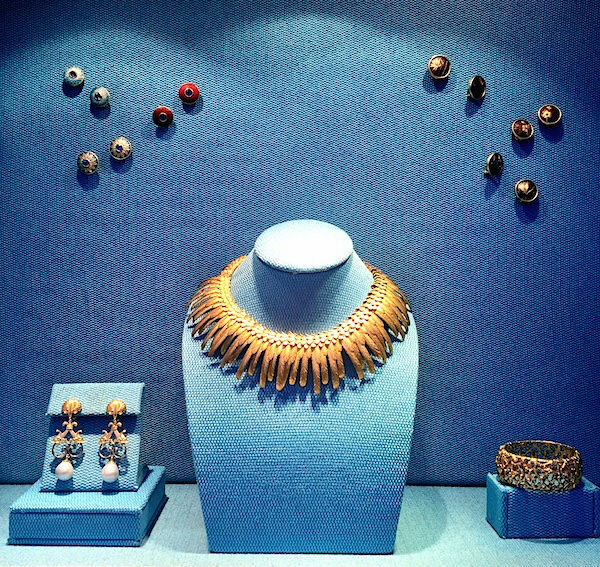 Using timeless techniques and the most exquisite materials, he produces unusual and eminently collectible jewelry that has lasting value. With impeccable workmanship, his pieces have classical references but are totally of today. 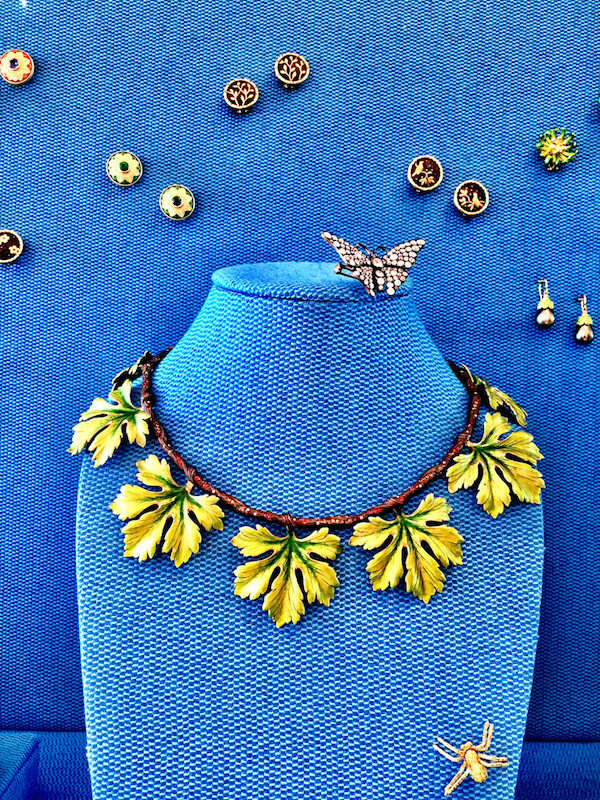 Above a centerpiece of a beautiful hand engraved necklace of maple leaves in 18K gold with translucent shaded green enamel suspended from silver branch studded with spessartite garnets surrounded by a selection of cufflinks and brooches. Above a signature Feather Necklace of hand engraved 18k gold feathers. The earrings to the left are Classical Sea Dolphins of 18k gold and palladium with South Sea baroque pearls. 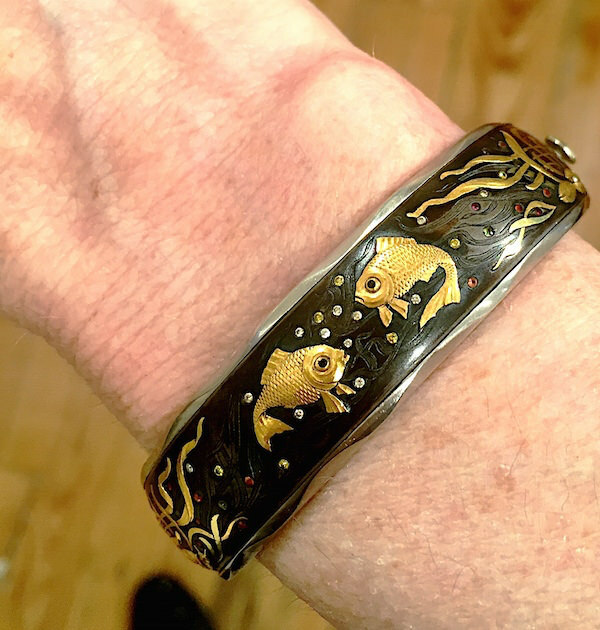 There is a special collection created specifically for Nantucket of metal shell charms and pearls as well as this stunning fish bracelet I tried of incised gunmetal with gold and gemstones. 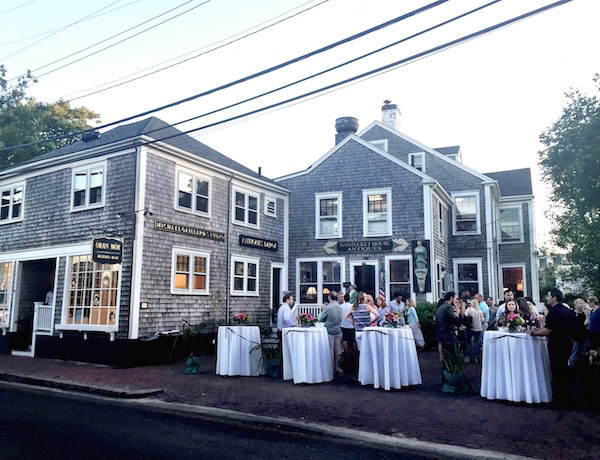 Upstairs sits longtime island favorite Oran Mor, serving fresh seasonal dishes in a cozy New England atmosphere. They provided the food for the party in the adjacent outdoor space. While I was a late arrival, there were still some delicious nibbles to be had, including the outrageously delicious paté. Hope you’ve enjoyed the inaugural Friday Five. Wishing everyone a very happy holiday weekend! See you on island! This entry posted in art, fashion, furniture, interior design, jewelry, Nantucket, photography, travel. Entry Tags: Friday five, James Robinson, Michael Gaillard, Nantucket, Nantucket House antiques, Oran Mor, Photography, R. Simantov Bookmark the permalink. I love this post Stacey. Hope to see you at the beach club!! Cynthia G.
I feel as though I am walking past my favorite haunts from the house we often stayed in, just a few blocks toward the ocean…..and if I keep walking past your five – ta dah! an ice cream cone at the Juice Bar awaits!! !